Increased choice is the mantra of the digital age. But it is difficult to square that mantra with how classical music is now controlled by a few major corporations from the cradle of music publishing to the graveyard of multiple record stores. In a post last year I described how the classical music supply chain has become vertically integrated with massive corporations extending their control back towards the composer and forward to the listener. One example of a cradle to grave corporation is the BBC, where control extends from deploying the world's largest new music commissioning budget and influencing artist career development, to managing the world’s largest classical music festival, the BBC Proms, and developing content delivery technologies such as iPlayer. 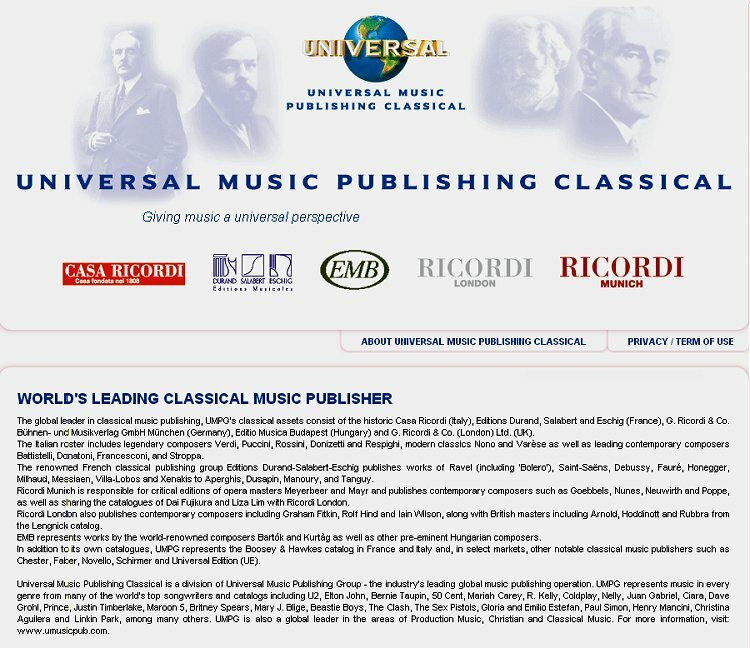 Another even more striking example is Universal Music, where control extends from classical music publishing, through recorded music and web journalism, to online stores. 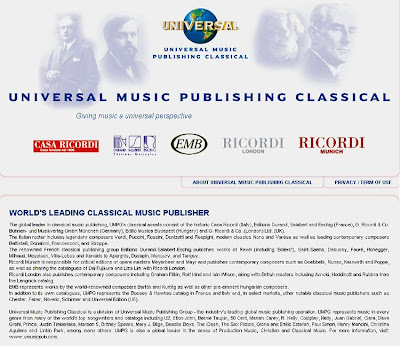 The global leader in classical music publishing, UMPG's classical assets consist of the historic Casa Ricordi (Italy), Editions Durand, Salabert and Eschig (France), G. Ricordi & Co. Bühnen- und Musikverlag GmbH München (Germany), Editio Musica Budapest (Hungary) and G. Ricordi & Co. (London) Ltd. (UK). The Italian roster includes legendary composers Verdi, Puccini, Rossini, Donizetti and Respighi, modern classics Nono and Varèse as well as leading contemporary composers Battistelli, Donatoni, Francesconi, and Stroppa. The renowned French classical publishing group Editions Durand-Salabert-Eschig publishes works of Ravel (including 'Bolero'), Saint-Saëns, Debussy, Fauré, Honegger, Milhaud, Messiaen, Villa-Lobos and Xenakis to Aperghis, Dusapin, Manoury, and Tanguy. Ricordi Munich is responsible for critical editions of opera masters Meyerbeer and Mayr and publishes contemporary composers such as Goebbels, Nunes, Neuwirth and Poppe, as well as sharing the catalogues of Dai Fujikura and Liza Lim with Ricordi London. Ricordi London also publishes contemporary composers including Graham Fitkin, Rolf Hind and Iain Wilson, along with British masters including Arnold, Hoddinott and Rubbra from the Lengnick catalog. EMB represents works by the world-renowned composers Bartók and Kurtàg as well as other pre-eminent Hungarian composers. In addition to its own catalogues, UMPG represents the Boosey & Hawkes catalog in France and Italy and, in select markets, other notable classical music publishers such as Chester, Faber, Novello, Schirmer and Universal Edition (UE). Which means, in plain English, that classical music’s lifeblood – the score – is controlled by a cradle to grave corporation. Such is the degree of control exerted by these corporations that the most unlikely parties have chosen - or been forced - to form alliances with them. One notable example is the charismatic ECM label which very successful portrays itself as a fiercely independent maverick in a corporate-dominated industry. Yet ECM has a contractual collaboration with Universal Music and its predecessors that dates back to 1976, and today Universal subsidiaries distribute ECM releases in the USA, Canada, France, Germany and Japan as well as in smaller territories. Which means, again in plain English, that in many of the world's major markets Universal controls the crucial interface between ECM’s music and the listener. None of which detracts from the excellence of ECM’s output. But it is worth noting that in 2011 Universal Music issued a press release celebrating thirty-five years of collaboration with ECM; however the label itself is rather more coy, and in Horizons Touched, the official history of ECM, there is not a single mention of its long-term global partner Universal Music. Although they are not all prepared to admit it, very few people in classical music are beyond the reach of the cradle to grave corporations – not even celebrated composers, music journalists and industry mavericks. Like the rise of the internet and the consequent demise of independent record stores, corporate control may be an inevitable part of 'progress', and more of the Sinfini Music-style of clandestine corporatization may also be inevitable. But that does not make it a good thing. Simon comments by email: I recently read ECM: A Cultural Archaeology, which also makes no mention of Universal either. ECM and a huge number of its artists have formed such an important part of my musical life for over 30 years now – I think my first ever purchase was the Art Ensemble of Chicago’s Urban Bushman, on the basis of a review in the NME of all places, when I was in my very early 20s, and I would be embarrassed to tell you how many ECM CDs and records I now own! So, what almost feels like obfuscation on the part of the label around the Universal relationship actually really upsets me. I would much rather they/Manfred just “came clean”.